A tester commented that it was comfortable right out of the box. A runner noted that this shoe did not need a break-in period; it delivered well from the get-go. The stability mechanic of this model was appreciated by those who needed aid in overpronation. The upper unit was able to hug the foot snugly and securely, commented a purchaser. The responsiveness of this shoe’s platform impressed several reviewers. Based on consumer feedback, the cushioning system was suitably soft yet long-lasting. The overall quality of the Saucony Guide 10’s components and parts was appreciated by those who have tried it. A reviewer was able to use it on light trails, and they said that it still performed agreeably. A couple of users wrote that the Guide 10’s performance has greatly improved from its predecessor. Some buyers thought that the Saucony Guide 10 is an affordable shoe. Some runners felt that the forefoot area was a bit narrow. According to a purchaser, the footbed of this version placed pressure on the ball of her foot, causing some numbness. Another experienced forefoot pains and numbness in the big toe. The interior cover system has caused some blistering to the foot of a tester. One runner felt that the cushioning of the Guide 10 was not thick enough for the underfoot. Several reviews stated that the sizing of the shoe runs small. A user complained that the threads of the upper had come undone easily. The Guide 10 might not be comfortable for wearers who are not overpronators, according to a tester. Overall, many runners agreed that the Saucony Guide 10 was a solid update to the long-running series of stability shoes. Many were pleased that the shoe has delivered an excellent performance that is consistent with the previous years. Although some had a negative reception with the updates—especially sizing—others argue that these are subtle and did not affect their running experience. They noted that the supportive mid-foot section reduced pronation tendencies, while the plush cushioning system offered reliable responsiveness. If you are looking for a supportive and well-cushioned shoe, you don’t need to look further. 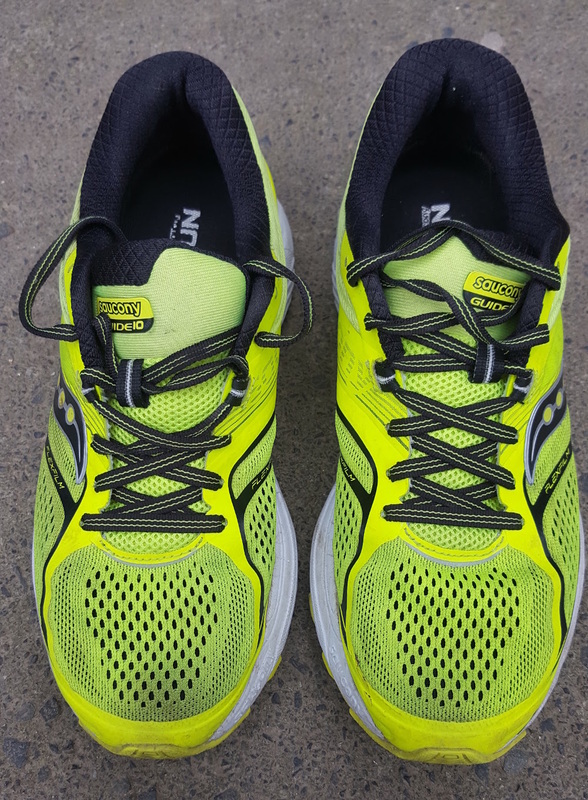 I tried these shoes when I was looking for two main things: A supportive shoe for mild pronation and good cushioning for high mileage on hard surfaces, especially in the forefoot area, where I had developed some issues. With Guide 10, Saucony has done a great job of producing a very light shoe. I really loved these shoes from the instant I first tried them on in a shop. They do not have a large toe box like Mizunos, but the toe box is much better than Nike’s (I cannot even move my toes when wearing Nike). I was feeling so comfortable wearing Guide 10, that I (unwisely) decided to embark a long run in these without first breaking them in with a few easy miles. I didn’t need to transition into these before running in them; I just felt comfortable in them from the outset. While you often need to run dozens of miles in other shoes before you can have confidence they are not going to cause blisters after a long run, it’s not the case with these. Guide 10 is a supportive shoe that is very light; it weighs only 283g (size UK 8, EU 42). Manufacturers like Asics haven’t managed to produce such a lightweight shoe, even their flagship Metarun model is heavier than the Guide 10, yet it comes with a price tag that is almost double that of the Guide 10. Since Guide 9, Saucony has put an extra layer of foam between the foot and midsole. This gives the shoe extra cushioning, something that is very welcome for runners like me who run most of their miles, if not all, on hard surfaces like asphalt. Generally, the shoe has excellent durability. Even after hundreds of miles, it is still responsive, especially in the forefoot compartment. Good responsiveness in the forefoot department makes it a very good shoe for road racing, although I don’t think it was explicitly developed for this purpose. The pictures have been taken after roughly 400 miles, mostly on asphalt. As you can see, the outsole has not deteriorated and it still good enough for runs on terrain, or trails. I ran a marathon after 330 miles of training in these shoes without any issues. After 300 miles, a lot of other shoes do not provide enough cushioning or are not as responsive, both of which are, indeed, essentials for a long road race such as a marathon. The shoes come in different colors. My preference is the citron version; however, you can sometimes find the blue and grey version at a lower price. I very rarely fall in love with a shoe. But this time, after just 100 miles, I knew I was going to run for a long time wearing these shoes. In fact, as soon as I found a good deal, I bought another pair (the blue and grey on the picture), even though the pair I was already using (citron in the picture) were still in good condition. It is very hard to find forefoot cushioning as long lasting as that of the Guide 10 in another shoe, especially of this weight and flexibility. The shape is comfortable overall, and the outsole is suitable for different kinds of surfaces, from asphalt to grass and terrain. Definitely, a shoe to consider if you are looking for a moderate supportive and cushioning trainer. "You are a neutral runner", they said. "You can use any running shoe", they said. So I did for almost two years until my old neutral shoes started to beg for replacement. (Ok yes, and Black Friday was coming). Then I began to look for options. This time, I took a real foot pronation test to be sure I'd do the right purchase. Surprise! Left foot neutral; right foot moderate pronator! So you tell me I have to narrow my choices down to heavy, boring, stability shoes? I knew about great discounts in a store near home. They represent Guide 10. But, Saucony? Really? Heavy, bulky, conventional design? Persuaded more by the generous discount than anything else, I decided to face my new reality: I needed stability shoes and a Saucony model seemed to be a good choice for its price, features, and light weight! The very first steps didn't feel any heavy. There was a spongy response, smoother than expected, but nothing special yet. However, the fun started when I defied the shoes to engage “race mode”. You only need a more aggressive break step, and the Guide 10 wakes up and simply drives you forward. The Everun cushioning system provides an additional layer of impact absorption between insole and midsole and boosts you to a funnier, confident and faster run. But going downhill was my perfect first date with my not love-at-first-sight new shoes. There it was when I got the charm. I even forgot to be too cautious about my iliotibial band syndrome pain. The Saucony Guide 10 just responds with agility and protection to your foot strike and pushes your joyride. Unlike the toe box, it has a wide outsole that counts on the Tri-flex feature to disperse landing forces, which results in a reliable platform to land and then lift off. However, maybe I got too excited when I got really fast downhill. I experienced a disappointing pressure in the joint of my big toe and foot. Toe box too tight or narrow? Yes, a little. Despite the tight toe box, Guide 10 breaks in almost in the act and you can easily enjoy your miles ahead. It can support your smooth ride with no trouble but also knows how to push race mode button. There is a “neuronal” connection between the cushioning and protective features and the considerable low weight. It feels like it´s just one thing. It senses when you want to have fun, and the midsole and outsole know it. A solid but fun and responsive package that doesn´t look like it. The appearance is a little bit too shy and traditional to declare it at first sight. There´s more material than needed. You can already trust enough to push your run further in distance or intensity, but the unnecessary grams of textile around your ankle come to mind at some point. Finally, the model wants to deliver more, but its toe box is a little bit too narrow to let you go. The eager spirit of Guide 10 is in some way retained by its overprotective parents. Certainly, Saucony Guide 10 is not the most attractive model and can´t boast of innovating aesthetics. The pair looks simple, quiet, “Sauconish” and doesn´t take risks in that field. I would thank a more sporty and aggressive style according to the spirit of the shoe; besides, less material in the tongue and ankle support; thus, less weight. We know, by far, it´s not intended to be a competition featherweight shoe, (Fastwitch and Type A6 are), but, come on, Guide 10 has the attitude. It delivers a firm and safe ride, but lets you have fun from the very second you strike your foot more aggressively. It's indeed a solid but fun and responsive pack; a widely versatile shoe for your apparently regular training session. A receptive and willing moderate pronator shoe placed between the light fast-paced models segment and the more protective and cushioning segments. A model you can not only like and enjoy, but also trust. It's a shoe that still delivers good stability for moderate overpronators and a really soft and go fast ride. This shoe performs really well, especially those long runs that lead to a marathon. Saucony pointed out the changes in the 10th version of the Guide for a better, more adaptive fit and enhanced support for overpronators. One clear change is the introduction of a new engineered mesh. It is now seamless and slightly more flexible than the past model. The new upper offers a more form-fitting fit. Another apparent change in the upper is the removal of the thick and stitched overlays, including the ones that support the eyelets. With a no-sew construction, there should be lesser risk of developing blisters or hot spots. Breathability should also go up a notch as the engineered mesh has slightly bigger and more holes all throughout the upper. Saucony made the midsole and the heel a bit firmer than before. For minimal overpronators, this is a welcome development as it adds a little more stability to their runs. With a firmer heel and midsole, there is also a quicker transition from landing to take off. A minor change in the rubber placement in the outsole improves ground contact for better stability and enhanced flexibility. Fans of the Guide series will be delighted to know that the fit of the 10th installment of this popular series largely remains the same. There is adequate toe room, secured heel and midfoot. The shoe length is standard as well. Similar to the previous edition, the Saucony Guide 10 is available in Medium and Wide versions to accommodate runners of all foot volumes. The Tri-flex outsole—a material unique to Saucony—features numerous flex grooves for superior flexibility. With a very unique underfoot layout, the Guide 10 has optimal ground contact that disperses impact upon landing and delivers a more effective transition in the gait cycle. In the latest version of the Guide, the heel has more articulation for shock attenuation. IBR+ rubber is located in the forefoot and midfoot for improved traction. The tip of the forefoot, the heel, and other areas use XT-900 carbon rubber for added protection against wear and tear. The Saucony Guide 10 continues to utilize the EVERUN technology as the top sole for a springier and more resilient ride. Providing added cushioning is Saucony’s SSL EVA. This modified version is a bit firmer for enhanced transition and better stability for runners. Both the Everun and the SSL EVA are quite durable while still minimizing weight. The new engineered mesh gives a more adaptive fit and optimal breathability. Delivering lightweight support and are the FlexFilm overlays, which are melded into the upper. This heat-induced technology allows Saucony to deliver excellent support without the added weight or the risk of irritation. The tongue and the collar provide a luxurious feel all throughout the run. A RunDry technology, which has moisture and sweat-wicking capabilities, make every ride as cool and dry as possible. The Saucony Guide collection of running shoes was fueled by the idea to create a footwear that delivers the perfect blend of stability, flexibility, lightness, and cushioning—aimed towards overpronators—to act as a counterpart to their Ride series, which was targeted towards neutral pronators. When constructing the Guide model, Saucony’s target market was runners who wanted a durable running shoe that is perfect for long-distance runs. That, coupled with comfort and stability, is what inspired the makers to name it Guide: because the shoe is designed to “guide” the runner via a support structure. In this latest release, the Guide series continues to offer a durable and responsive ride, as well as providing a steady unit for runners who need the added stability. The continued upgrades of the Guide 10 enable the shoe to be ideal even for half and full marathons. Many users of the Guide series find this shoe a success because the adjustments made in consideration of the previous versions were done accordingly. With 10 editions under its belt, Saucony Guide continues to surprise by constantly providing new technologies for runners. One of the most notable improvements of the Guide series was when they introduced the EVERUN midsole material to their shoes, which started with the Guide 9. This update proved to be a good move as it was received favorably by users, especially those who are loyal to the Saucony brand. The upper received an entirely new look in the Guide 10. Coming from a traditionally constructed upper, the Guide 10 now presents a no-sew overlay set that aims to lessen skin irritations with the seamless finish. This design works best for wearers who prioritize comfort, while the Guide 9 would appeal more to those who are after support. When it comes to the amount of cushioning, the Saucony Guide 9 would suit those who want a plush, cushy unit, while the Guide 10 is more ideal for runners who prefer a firm underfoot structure. Although the difference might be negligible for some, it would be noticeable to runners who place importance on the sole unit, particularly overpronators. Another significant update in the Guide 10 is the removal of the SRC crash pad, which was located in the heel area of the Guide 9. The result is a running shoe that offers a more centered feel for the foot. Instead of a crash pad, the Guide 10 features a hard foam, resulting in a new design. The deep groove left by the crash pad improves transition and adds support, responsiveness, and flexibility. Albeit a small detail, the weight difference between the two Guide models remains a significant factor. 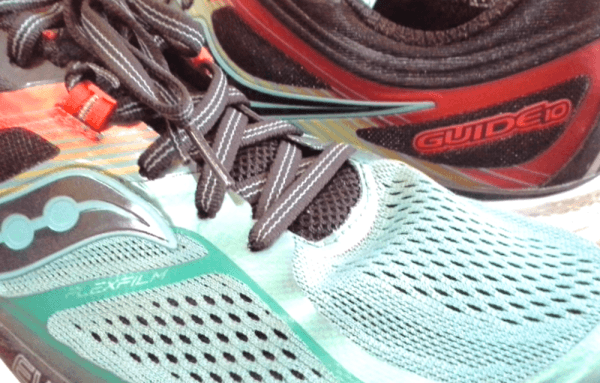 The 8-gram gap between the two shoes is certainly apparent, especially to those who run long distances and would perform best with a lighter shoe. Although the outsole still uses the same chevron tread pattern, there are still a few tweaks made from the Guide 9 to the Guide 10. One of these is the set of flex grooves that the Guide 9 has, but loses in the Guide 10. Instead, the Guide 10 uses a solid rubber in the medial side where the flex grooves used to be; this gives the outsole more ground contact and a wider forefoot flare. This design is well-appreciated by users who want more feel of their running surface. Saucony Omni 16 - Both the Guide 10 and the Omni 16 fall under Saucony’s line of stability running shoes, with the Omni 16 possessing a higher stack height and heavier structure. The shoes also utilize the same outsole techs, which are the XT-900 rubber and the IBR+. When it comes to differences, the Saucony Guide 10 is more ideal for runners who prefer a secure fit; it has a narrower structure compared to the Saucony Omni 16. Under Armour SpeedForm Europa - Although both are stability shoes, the Under Armour SpeedForm Europa might appeal more to experienced runners because of the number of shoe technologies it has under its belt. Despite this, the Saucony Guide 10 remains to be the more popular choice between experts and new runners alike. The reputation established by the Guide series has allowed itself to earn a following. Thus, for users looking for a trusted shoe with a simple and straightforward design, the Guide 10 is a good choice. Adidas Supernova ST - Runners who are after a lightweight shoe would definitely prefer the Guide 10 over the Adidas Supernova ST, as it has a substantial difference of around 30 grams. This added weight is translated from the sizable amount of boost™ in the midsole; the Supernova ST uses dual-density foam to help in overpronation. The Supernova ST might also be more appealing to runners who frequent long distances. Asics Gel Kayano 25 - In its 25 years of “service” in the shoe industry, the Asics Gel Kayano 25 is undeniably more famous, and well within reason. Almost all of the components of the Gel Kayano 25—from the outsole to the upper—are praised by users because of the unique technology used. Meanwhile, the Saucony Guide 10 prides itself with fewer but nonetheless effective features, which focus on the sole unit, to give a resilient ride and protective fit. Brooks Ravenna 10 - Right off the bat, the Brooks Ravenna 10 and the Guide 10 have different levels of stability offered to runners. The former is geared towards mild overpronators, while the latter is more suitable for moderate overpronators. The Saucony Guide 10 is a bulkier structure, primarily due to the substantial amount of midsole to aid overpronation. Is the Saucony Guide 10 worth the upgrade? If you have used the Saucony Guide 9 and have been satisfied with its performance, then the Guide 10 is definitely an even more worthy investment, as it was able to tweak and improve the factors that seemed to be lacking in the previous edition. The technologies that were used in the Guide 9 are still present, but now on their latest versions. The Guide series is considered a mid-range shoe, so if you found the Guide 9 to be a bit expensive, you might prefer lower-priced alternatives because the Guide 10 costs the same as its predecessor did when it first came out. In addition, the Saucony Guide 10 might not be as versatile as some runners would consider. There are other options for running shoes that are more cushioning, as well as running shoes for race-days or track workouts. The Guide 10 might not fulfill these activities to the runner’s expectations.